The Hopkinson Report » Episode 110: Interview – Can Adam Carolla time-shift podcasts back to realtime? « Episode 109: Can you market a physical product like an online product? Interview with WhiteyBoard.com. Episode 110: Interview – Can Adam Carolla time-shift podcasts back to realtime? Jim interviews top podcaster Adam Carolla, talking about his new format, podcast revenue models, and portable dishwashers. For years we’ve praised the concept of “time-shifting” as a unique advantage of today’s digital media. No longer are we forced into a do-or-die option of being present at a live event or face the consequences of missing it completely. We can use a DVR to record a World Cup game in the morning for viewing later that day, stream Saturday Night Live on our laptop via Hulu on Sunday morning, and forgo commercial-filled drive-time morning radio in lieu of an iPod’s worth of our favorite podcasts. 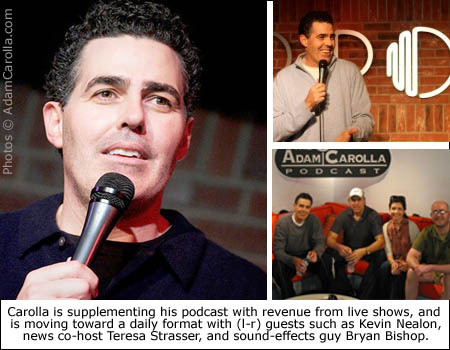 Since his live morning radio show was canceled in February 2009, that’s exactly what entertainer Adam Carolla (Loveline, The Man Show, Crank Yankers, Dancing with the Stars) has done. He’s amassed an army of loyal listeners that have downloaded The Adam Carolla Podcast millions of times, making his show a mainstay at the top of the iTunes charts. But now he is “getting the band back together” and attempting to combine the best of both worlds. He’s brought back nearly the entire staff from his former radio program, including news co-host Teresa Strasser, producers, announcers, and even sound effects wizard “Bald Bryan,” who is able to insert his comical sound bites into the podcast on the fly. However, in an interesting turn away from time-shifted content, Carolla’s goal is to get people to tune in daily to keep up with current events, essentially creating a drive-time morning show via podcast. The format allows him to avoid long commercial breaks, escape the watchful eye of both program directors and the FCC, and do what he does best – rant at will on any given topic – packing the show into 90 minutes vs. the four hours of live drive time. The plan is to record the topical shows late in the afternoon or evening, so that they are ready for download each morning. Will the new format be a hit with fans? And just as important, can he generate enough revenue to keep everyone happy? It’s hard to bet against him given his success thus far. I sat down with Carolla in New York City while he was in town promoting another of his myriad of projects — with more and more of them venturing into the realm of social media — a user-generated video contest called the Klondike Everyman Challenge. As a fellow podcaster that also enjoys weaving heavy doses of pop culture into the conversation, I brought up a unique similarity that we both shared: our families both owned ugly, hulking portable dishwashers in the 70s. This set off a classic Carolla rant that users have become accustomed to, reflecting back on his cheap parents and meager upbringing in North Hollywood. On the topic of generating revenue, Carolla has been fearless in trying new ventures. While the daily show is entirely free to download, he urges listeners to support the program in one of several ways. – Short pre-recorded and “live read” ads before and during the show, covering products as diverse as flowers for Mothers Day, souped up computers, BBQ grill accessories, and adult movies. So when I ask him what source has been most successful, he responds that any individual tactic isn’t a lot of money, but you start to get a cumulative effect with multiple sources of income. 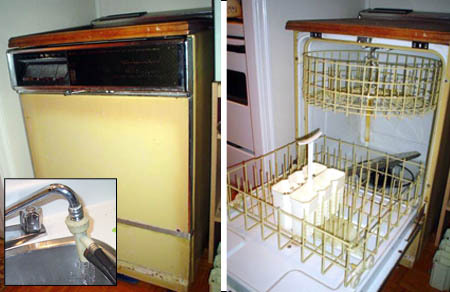 Yellow dishwasher: ‘Jeremy’ successfully selling it for $40 on ‘Nova Scotia Classifieds’ in 2007. Connector hose: ‘FantasyGoat’ on gigposters.com, using it as part of his still when creating homemade moonshine. This entry was posted on Thursday, June 24th, 2010 at 3:36 am and is filed under Interviews, Pop Culture / Entertainment. You can follow any responses to this entry through the RSS 2.0 feed. Both comments and pings are currently closed.